Currently an office block next to Network Rail’s graffiti bridge, Coomb House, 7 St Johns Road, Isleworth was awarded planning permission for a 59 room budget hotel on 30 May 2014, see details here and here. Kentish Town based Architects Network Ltd, have been engaged to draw up new plans for the site and increase the number of rooms to 90, a building extension, public facilities as well as other proposals. 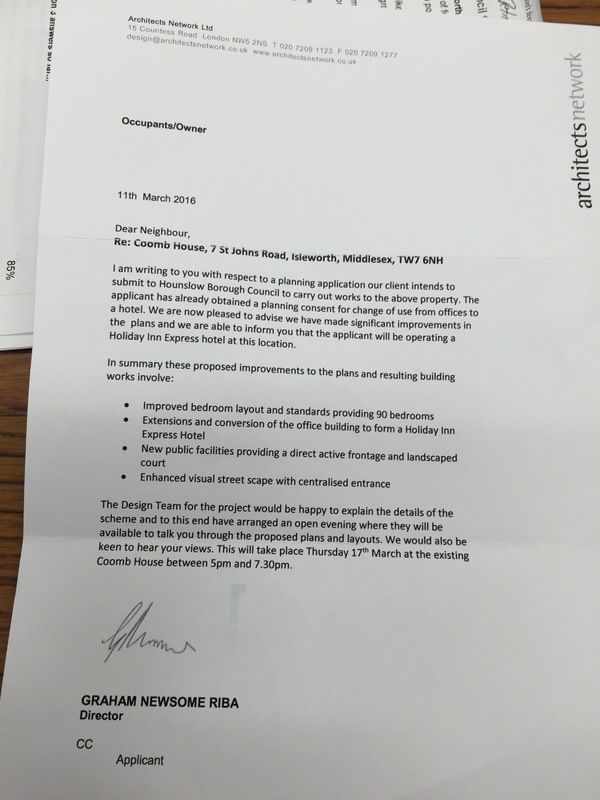 A new planning application is yet to be submitted to Hounslow Council but the design team have invited neighbours to a pre planning consultation to explain details of the scheme, to talk through proposed plans and layouts prior to a new planning application.